Inspired by abstract floral design, we wanted to create a painting-like design to decorate your bed with. Enjoy a contemporary floral design in beautiful rich color tones that are sure to bring out the artist in your decor. blanket is thin, not impressed with quality. white sheet had a stain so this was returned. Very pretty colors. The quilt is very thin. The fitted sheet is more for a king bed it is huge for the queen size mattress we have. Love it. Great price and beautiful product! Beautiful quilt. color as pictured. I really enjoyed my purchase. 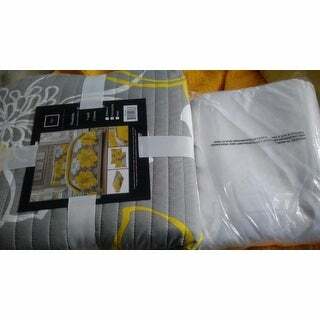 The bedding is made with quality material, soft, and durable. The vibrant colors has brightened up my guest room. The yellow and gray combination goes well with the colors in my room. Beautiful set. This is exactly like the picture very beautiful bright colors. My mom loves and it looks great in her room. The bright yellow bring a great touch in the style of the room. I love this! Looks and feels Great! I think it will go nicely with my new bedroom.